It is apple season in Minnesota! Each year we look forward to weekend trips to apple orchards opened to visitors at this time. Some orchards not only offer apples but also wines from their vineyards. Northern wines are a growing industry in our neck of the woods and we have several award winning vineyards dotting our rural landscape. It is interesting how traditional apple growers have combined their experience of cultivating apples and producing cider to the new cultivation of grapes for wines. 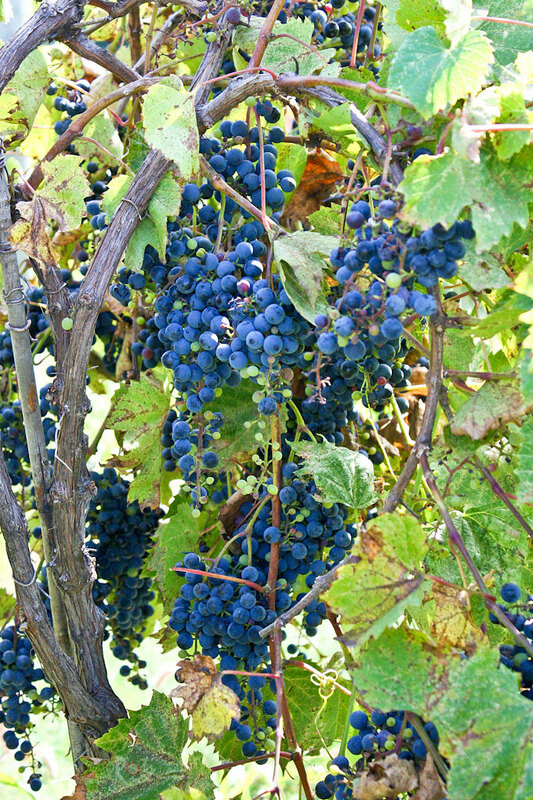 The University of Minnesota spent many years developing winter hardy grapes that work well in the rich prairie soil and short growing season. 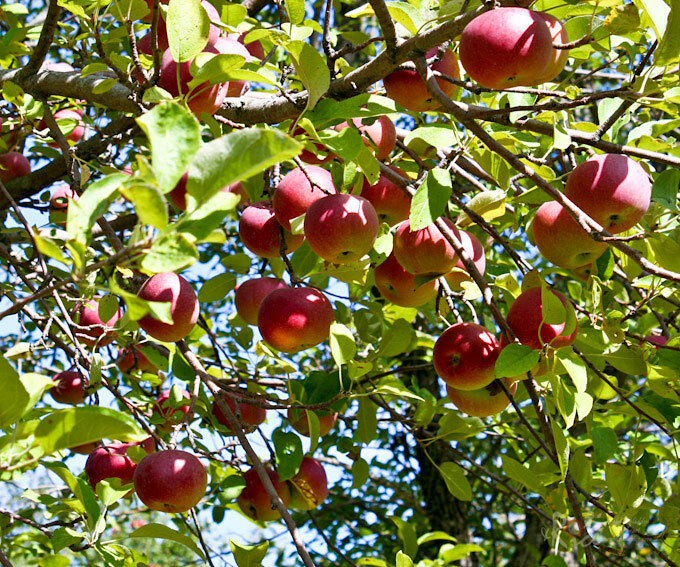 When European settlers arrived in Minnesota, there were no apple trees around. In fact there were hardly any trees, only an endless sea of prairie grass taller than humans. 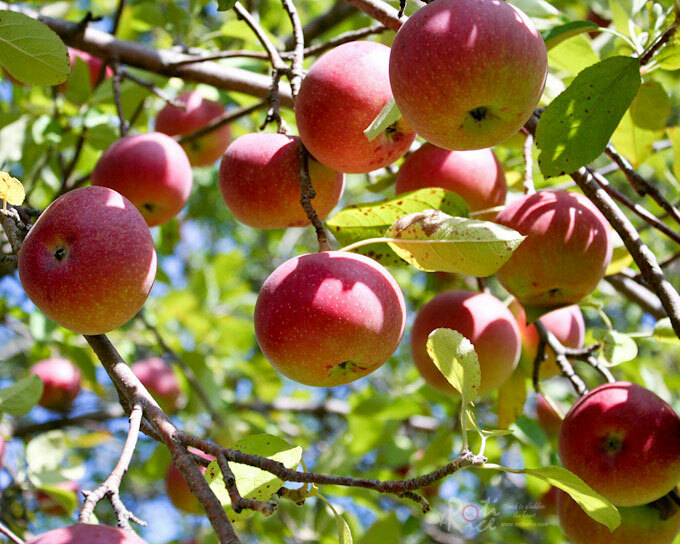 The early settlers planted all kinds of fruit trees but they could not survive the harsh winters. 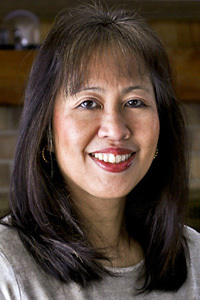 The College of Food, Agriculture, and Natural Resource Sciences of the University of Minnesota developed many apple varieties for our harsh weather over the last century. 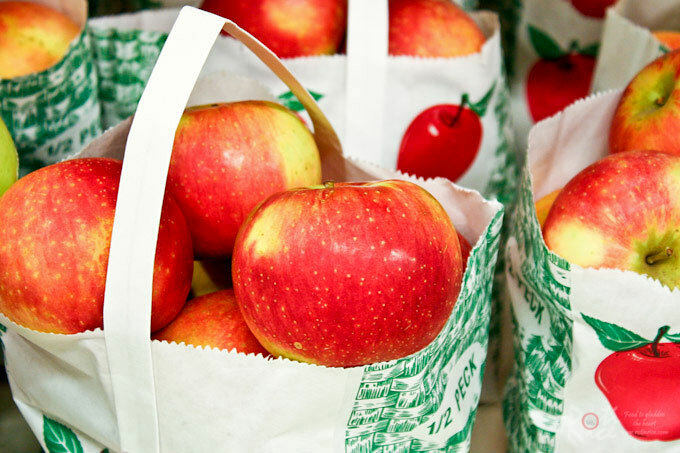 Today, we have popular Minnesota specialties like Honeycrisp and Zestar. These are crisp and juicy snacking apples. 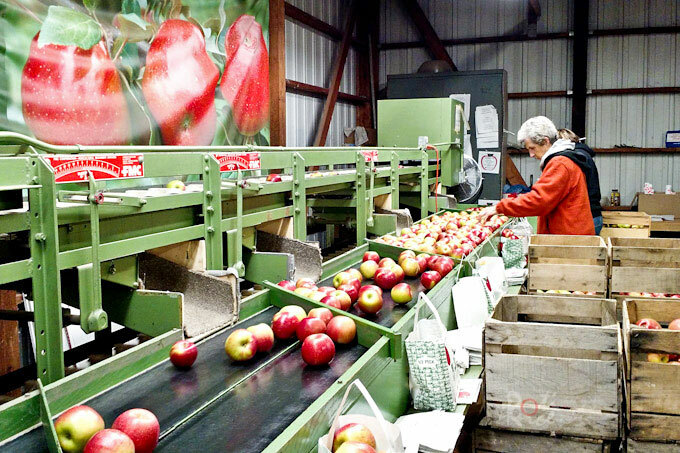 Apple orchards are found in and around central and southeast Minnesota concentrated around the Minnesota and Mississippi river valleys, not far from where we live. Apple picking begins as early as end of August through October. 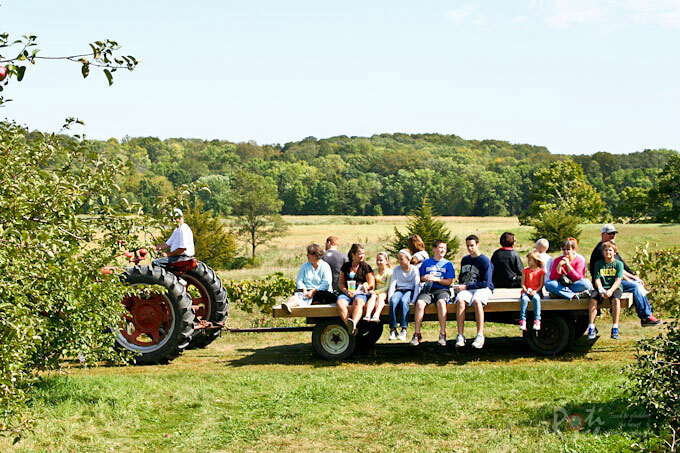 Orchards open to the public attract visitors with all kinds of creative activities like tractor and hay rides, corn maze, petting zoos, food trucks, wine tasting, and the likes. 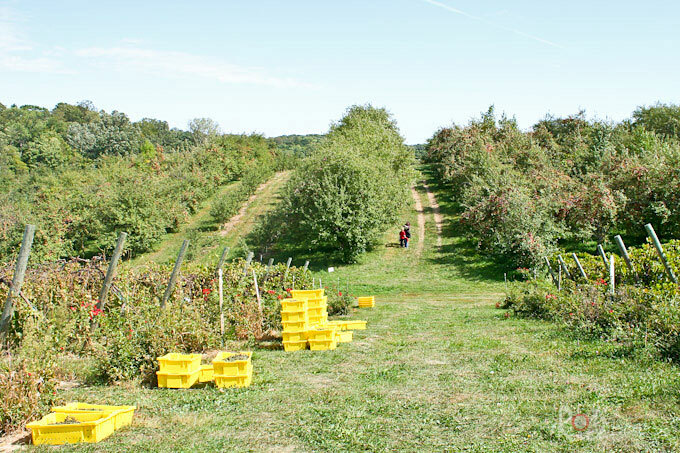 Visiting an orchard is a fun way for families to enjoy and discover Minnesota’s Apple and Wine Country. The two varieties ready for picking at this time are McIntosh and Haralson apples. These are cooking apples good in pies, cakes, and muffins. Cooking apples tend to look more round and squat. Shown in the picture below are McIntosh apples. 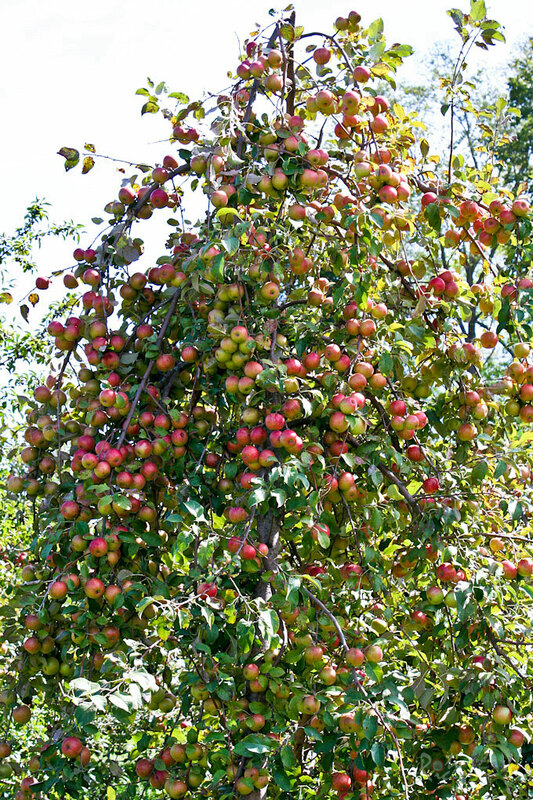 Since it is still pretty early in the season, the trees are heavy laden with fruits. Shown here are Haralson apples. Just beyond the groves of apple trees are the grape vines. We were pleasantly surprised to see all those rows of grape vines now in their fifth year in this orchard. 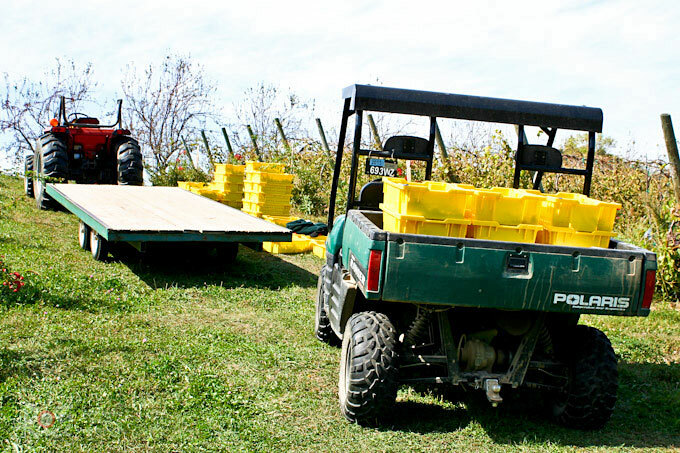 The workers were out harvesting the La Crescent grapes used for white wines. 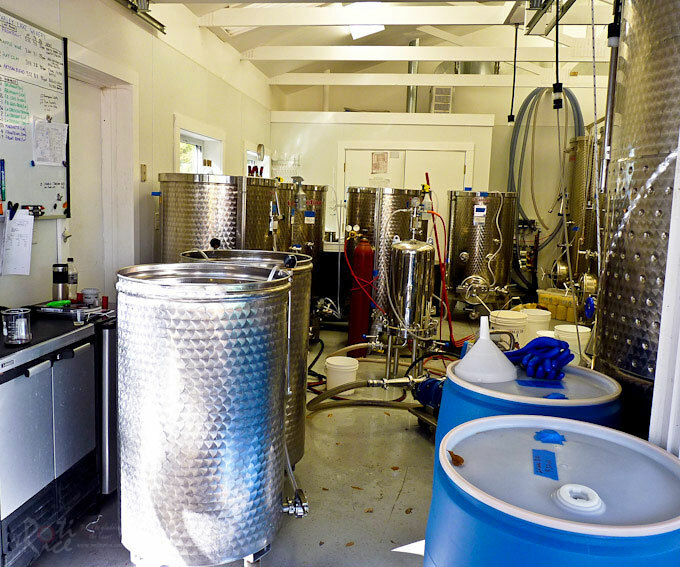 Here is a peek into the filtration room. 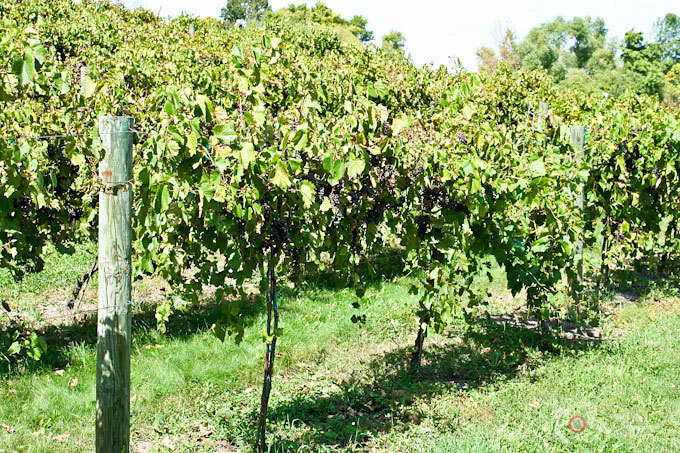 The four cold hardy wine grapes grown here are Frontenac, Frontenac Gris, La Crescent, and Marquette. Frontenac wine has a deep garnet color with a distinctive cherry aroma. Frontenac Gris wine has aromas of apricot and citrus. La Crescent wine has a nose of apricot, peach, and citrus. 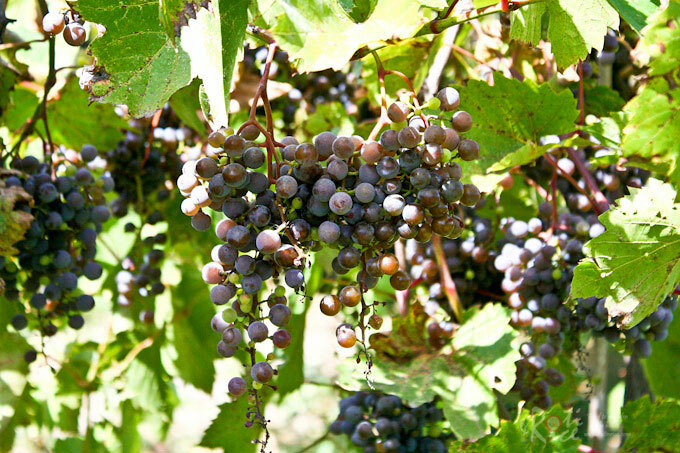 Marquette wine has an attractive ruby color with notes of cherry and black pepper. We had a most enjoyable time at the orchard. The weather was perfect and there were not too many people around as it is still quite early in the season. 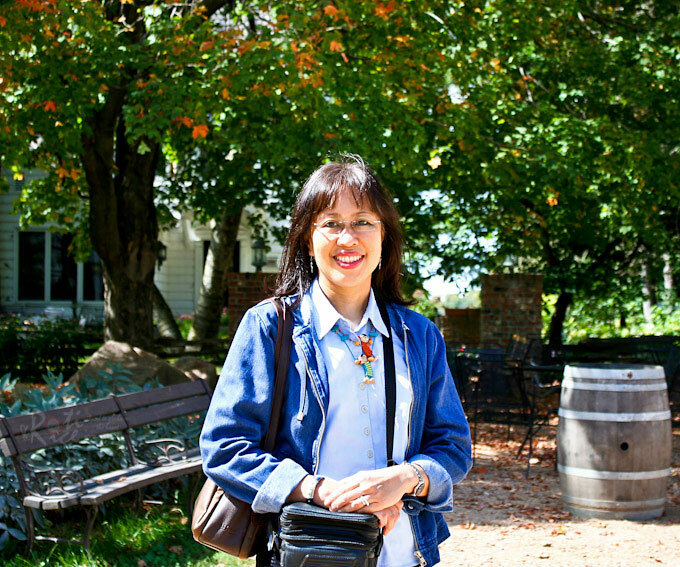 We tarried a little after the wine tasting before heading back to the city for a late lunch. Do check out some of my apple recipes by clicking on the respective picture to get to the post. 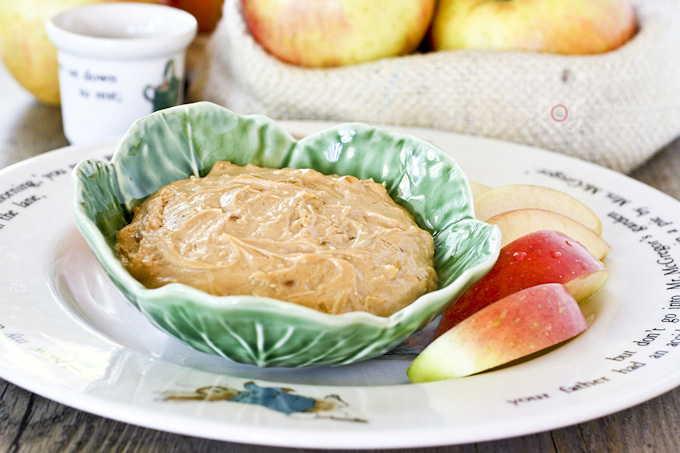 This Peanut Butter and Cream Cheese Dip is delicious with apples, crunchy vegetables, and pretzels. Thanks for the “tour”, Biren! Cider with cinnamon is sometimes served warm at the stores. It is a nice welcome at the entrance on crisp fall days. Ahhh…the scents of fall… so warm and inviting! This is so fun! Wish I could join u there. Thks for the apple tour, dear! I look forward to apple picking each year. Love the weather at this time of the year. oh i have always wanted to visit a vineyard and see wine being made first hand. This looks like a wonderful trip. Glad you got to get away! These small family own vineyards are fun to visit. Their wines are quite different and is a nice change from store bought varieties. The apples look so yum! Those apples trees are loaded!!! What fun to be able to get apples or any fruit right off the tree/vines. The grapes look so juicy and I can only imagine the wonderful wine they make. A cherry aroma – OOOOOHHHHHHH! Looks like you had a fun time and wonderful trip pretty lady! What a great time that must have been! 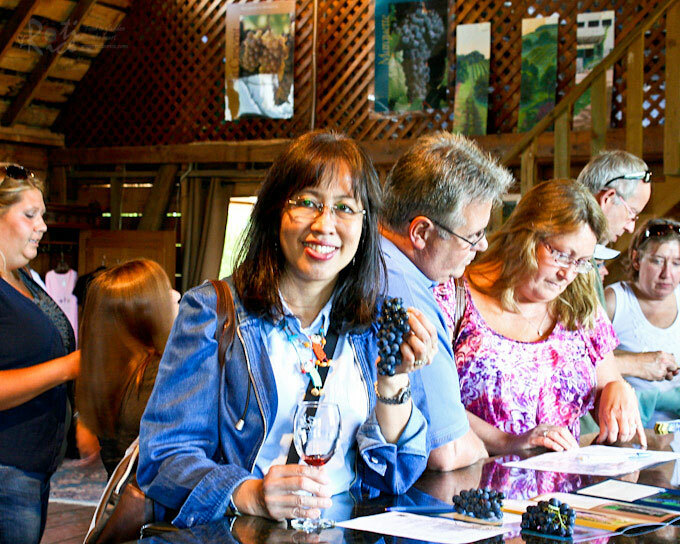 We’ve never done a wine tour – we so totally need to do it. 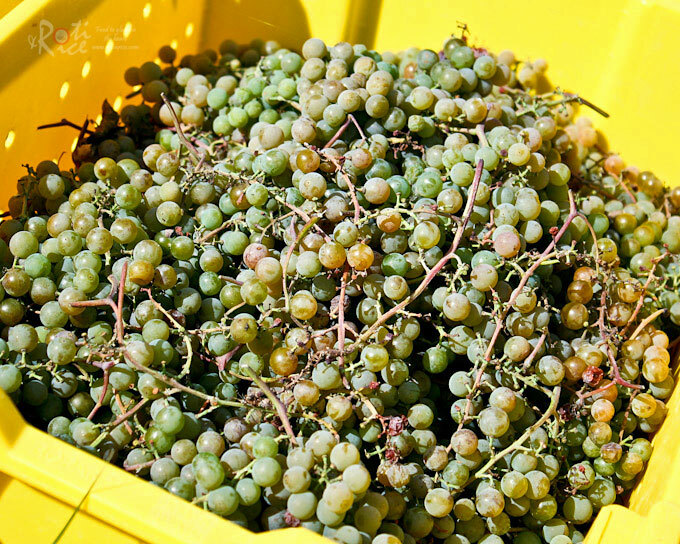 Love the picture of you holding the grapes – what fun! And fun is what this post was – thank you.